Save when you buy the M5 Upper Receiver and ATLAS R-ONE Handguard Combo! The M5 .308 Assembled Upper Receiver comes with both the port door and forward assist hardware preinstalled. Forged from 7075-T6 aluminum, this assembled upper is precision machined to accept standard .308 components and is the perfect upper for your big bore build. Match this with our M5 .308 lower receiver for a solid and dependable fit. 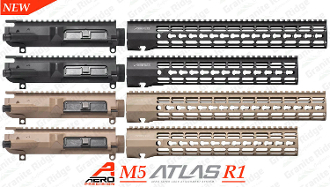 R-ONE Handguards are now available for the M5 platform. Machined from 6061-T6 Aluminum, the R-ONE offers a lightweight and slim profile that features a full-length top Picatinny rail section allowing the user to accessorize their build as needed. Our proprietary ATLAS attachment system is a durable and dependable mounting platform that maintains the slim profile while still providing the strength and stability customers have grown to love from Aero Precision handguards. Available in 12" and 15" options.